Nuclia Waste at the Denver County FairIt's Thankful Thursday, a weekly pause to appreciate the people, places and things in our lives. Joy contracts and expands in proportion to our gratitude. What makes your world expand? I spent the weekend spreading poetry love at the Denver County Fair. 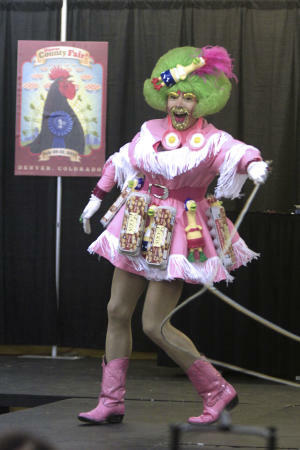 A modern interpretation of the traditional fair, this annual event is a creative mash of farm fun and freak show crazy. The weekend includes a poetry contest (ribbons! cash! prizes!) and a poetry performance in which finalists take to the stage. The reading was nicely sandwiched between the pie eating competition and the hot dog eating contest (How much can you eat in three minutes? Behold the beauty of gluttony!). Just before the reading, a woman motioned to me, gripped my hand, and gave me a laser stare: Thank you, she said. Thank you for making a place for poetry, for us. And I thought, power to the poets! To those who explore the world with words and know the value of a well-placed comma. To those who study line breaks, music and meter. To those lifted by language and stirred by stanzas. Power to the misfits, the outcasts and the understudies. Among the chickens, children, and clamor, I heard a crowd chanting eat that pie! eat that pie! and I knew I was home, among my people: the freaks, geeks, artists and outsiders. On this Thankful Thursday, I am thankful for my people. What are you thankful for today? Who are your people?